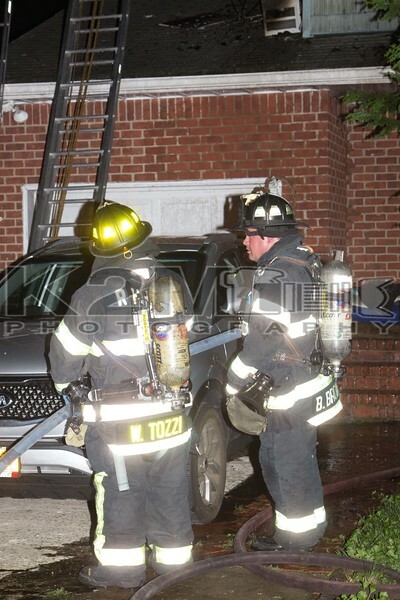 Late on the night of Wednesday, August 17th, 2016 the Roslyn Fire Companies were dispatched to a reported house fire at 218 Garden Street off of Jefferson Avenue in Roslyn Heights. The first fire department units to arrive on scene made their way into the home to investigate where they discovered they had fire in the walls of the home on the second floor. A signal 32 [general alarm for manpower] was transmitted and then followed by a signal 10 [working fire] moments later. Port Washington was designated the FAST and responded with Heavy Rescue 8522 while Glenwood sent one engine to the scene. At least two hand lines were stretched resulting in a quick knockdown of the fire which kept it to the original fire room. The scene was placed under control in under one hour. No injuries were reported; however, multiple cats were inside the home at the time of the fire with some having been pulled out and successfully resuscitated. The cause of the fire remained under investigation.